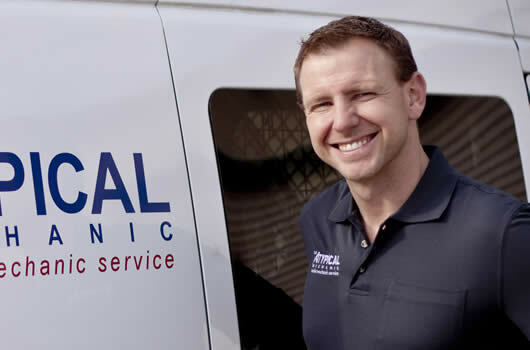 We are a mobile mechanic company that has served Austin since 2007. Our goal is to make your life easier by making sure you never have to take your car to a shop again. One of our reliable mechanics will come to your home or office and do all your automotive services there so you can focus on the things that are important to you. Our mobile vans are fully equipped, allowing us to perform routine maintenance like oil changes to larger jobs like replacing timing belts. Our prices are very affordable with average savings over traditional mechanic shops of 30% or more. We are client recommended and proudly suggest checking out our outstanding reviews. Once we receive a request for service one of our service representatives will contact you by phone. They will go over the information provided in the request and provide a quick estimate. 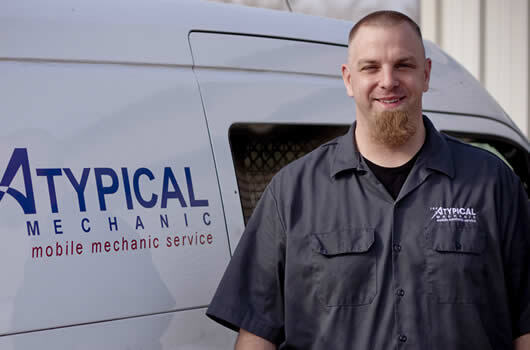 They will schedule a time that is convenient for you to have one of our mobile mechanics meet at your home or office. Once your mechanic is at your location, they will contact you and let know they arrived and are ready to begin your repair. They will do a walkthrough of the problem, get approval for the estimate and perform the work while you focus on your life. Once the work is completed, they clean up, walk you through the completed repair and your payment. Found Jeremy, The Atypical Mechanic over 4 years ago and have used his services ever since. Not only dies Jeremy come to your house but, he is very trustworthy and reliable. I was so impressed with his service that I recommended him to my HR department, now he comes to our office once a month! Excellent service. Great convenience - they've come to both my home and my work. Makes it a lot easier than finding time to take my car to a shop. Very thorough. I like this company a lot. My experience today with these guys was great. They tentatively diagnosed my problem over the phone and had the parts with them when they arrived. They quickly figured out the problem, fixed it and charged a really reasonable rate. The technicians were professional, clean and well-spoken. I'll definitely be using these guys again! Jeremy came to my work and did a brake job for me. Very good prices and he does it at your work or home. Did a great job. I will be using him again!! Simply put, I'm going to trust this guy to look at my car as long as I live in Austin. I didn't get a chance to meet him since I was at work, but he certainly seems to know his stuff based on the reviews and didn't gouge me, which is pretty standard in the biz. Thank you for the good vibrations, man. Jeremy showed up earlier than expected, only sold me what I needed and got my car back on the road quickly. Who Doesn't Love a Mobile Mechanic? Who doesn't love a Mobile Mechanic?! I've had 3 different cars serviced by Jeremy or one of his counter partners and have NEVER been disappointed. They are very efficient, very professional, and always available. You've gotta be crazy out of your mind to try anybody else! I'm not a mechanic, but I used to be ASE certified, and worked in the car repair biz, so I know a thing or two, about cars. He correctly diagnosed the problem, and fixed it for 80 bucks. A car repair for only $80??? Really??? Our mechanics can provide the minor maintenance today to save you major repair bills down the road. Evaluations usually take from 30 minutes to an hour to complete. We will evaluate the problem and provide solutions. We are fast, courteous, and our ASE certifications mean you can trust us to do your repairs. Changing your car’s fluids minimizes the risks of breakdowns and prolongs the life of the engine, transmission, cooling system and brakes. Don’t ignore a loud knocking noise! When you hear a knocking noise when going over bumps it is easy to assume that you can wait to get it taken care of. For the most part that’s true. A bad shock or a bad sway bar link will usually just make more and more noise until you’re forced to replace it. The first thing you have to do is identify what part is causing the noise. Unfortunately this can be a bit of a choir. If you look at the suspension and there are some obvious parts that are missing bushings or not in their brackets, all you have to do is replace the part. Don’t procrastinate if you see some bushing that are missing! A part that is hitting metal on metal will eventually damage the bracket that is holding the part. The picture is of a shock that elongated the hole it went through. What if its not obvious whats making noise? Start by identifying when you hear the noise. Does the knocking only happen when going over bumps or when you’re driving down a bumpy road? Then try duplicating the noise while the car is still. Joust the car up and down to see if you can hear the knocking. If you can have someone get under the car to see where the noise is coming from. Does the knocking noise only happen when going over bumps? Most of the time this means that your shocks or struts are making the noise. This isn’t always the case but the majority of the time its true. Does the knocking noise only happen when driving on a bump road?